Look what I woke up to this morning - frozen fog! This is one of the most beautiful weather phenomena here in the High Plains of Western Kansas. 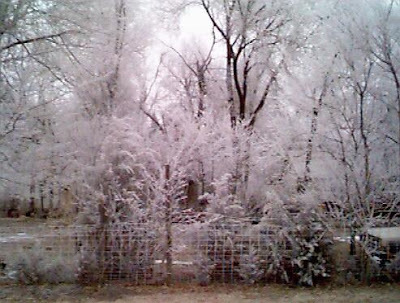 I like to call this "flocking" but the technical term is "rime ice." Some people call it "frost feathers." 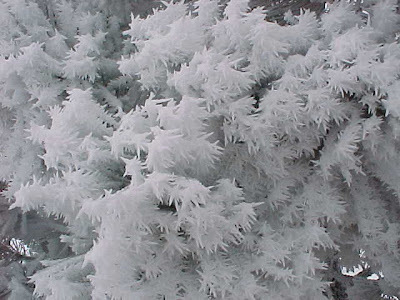 I looked rime ice up, and according to what I read, rime ice is formed when super cooled water droplets come in contact with a surface that is also at a temperature below freezing. The flocking effect happens because the miniscule ice particles are somehow mixed with air pockets. Sadly, as soon as the sun came out, all the flocking was gone, just a memory in a photograph.